Sautéed prawns - how deliciously easy, deliciously tasty. A great evening meal prepared in minutes - perfect for hungry travelers. I traveled with two Enjoy Food & Travel co-writers Dagfinn Skoglund and Susanne Koch, to our summer home last weekend. We had been driving for 4 hours, so we needed something to eat quickly. 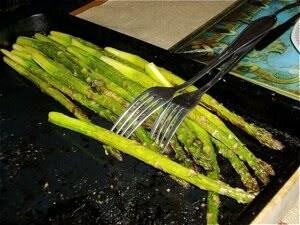 Dagfinn had roamed his kitchen and the nearby green grocers and had bought enough asparagus to feed an army. We decided to keep a few for later (and they ended up in a tasty Sunday morning omelet). The rest were drizzled in olive oil, seasoned, and placed in the oven to bake. Dagfinn sauteed the prawns in oil, with finely sliced shallots, my local fish seasoning, and lime juice. Many tastes, but well balanced flavours. Hollandaise is not easy to make. I usually end up buying the Knorr ready made sauce, as it tastes good and contains half the number of calories than other brands. We decided to try a more exclusive brand, and we purchased Jacobs utvalgte. More expensive, and much tastier than Knorr, and with 390 calories per 10 cl. We heated it slowly, while stirring in additional lime for taste. 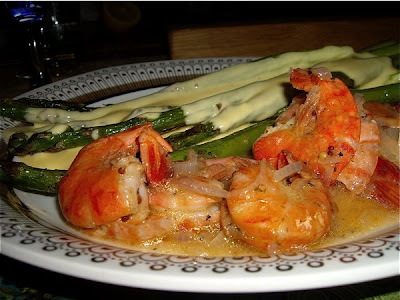 It was a wicked meal, the velvet soft, creamy sauce, prawns fresh and with a crunch, and perfectly prepared asparagus. I enjoyed the 'read' and loved the'watch' (on YouTube). You had me salivating there!